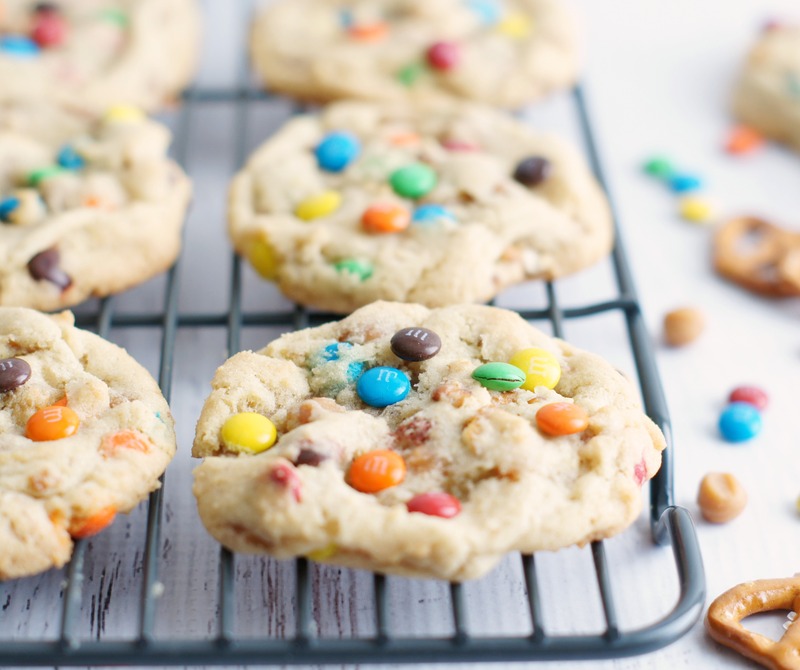 Hi, it’s me, the Queen of Cookies, bringing you yet again another cookie recipe. People ask me all the time if I make cookies every day and you probably might be wondering the same thing. Well, the truth is, I really don’t make cookies every single day, just almost every single day and my neighbors and friends love me for it :). 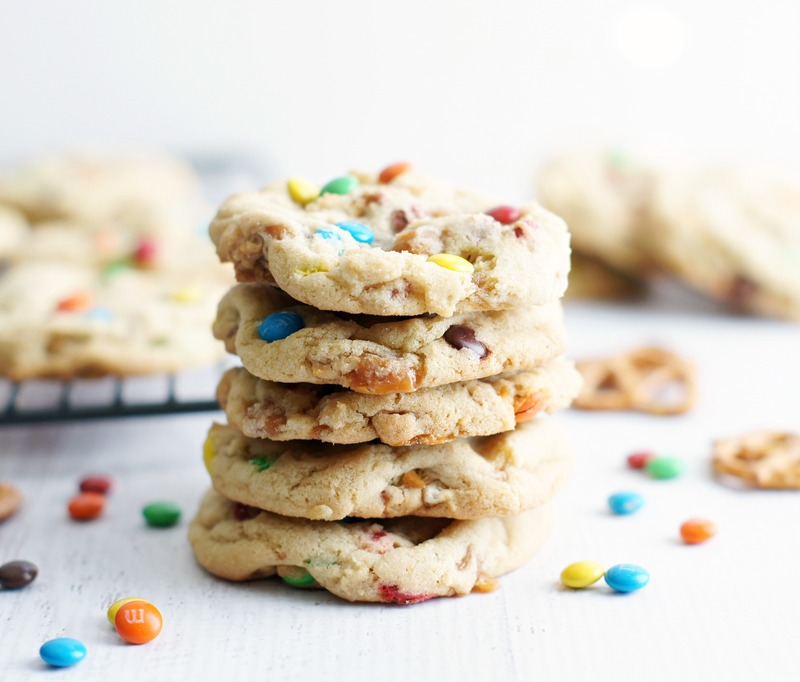 Meet my newest cookie creation. . . . M&M Caramel Pretzel Cookies. These things are sooo good and just so cute and colorful to look at, don’t you think. I am in love with mini M&M’s. I’ve kind of been stock piling them whenever I see them on sale, because like chocolate chips, you can never, ever have too many bags of mini M&M’s on hand. I actually have to hide them from my son Taylor, because he’s slightly addicted to them and he could/would eat my entire supply if he knew where they were. He likes them better than regular size M&M’s, which I kind of get because they are pretty dang cute. I’m pretty sure he can smell them from miles away because he always seems to innocently wander in the kitchen while I have an open bag lying on the counter waiting to be dumped into cookies. 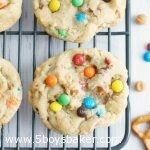 These cookies are buttery & crispy, chewy from the caramel bits and slightly salty from the pretzels. Oh they are so, so good. Give them a try and if you’re a cookie dough lover like me, I dare you not to eat any of the dough. It’s impossible, I swear! 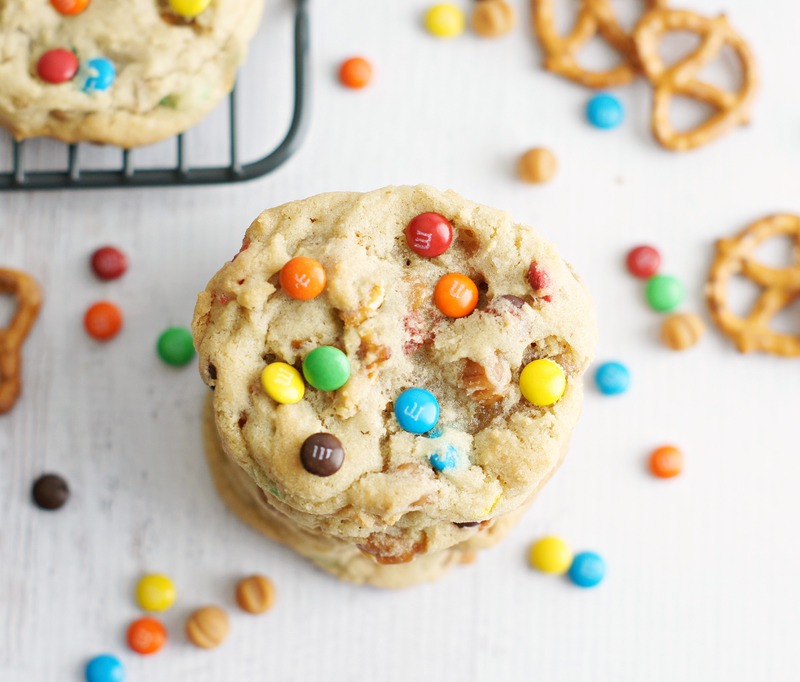 A buttery, crispy, chewy cookie full of pretzels, M&M's & caramel bits. . . .these are so good! In bowl of an electric mixer, cream butter and sugars until light & fluffy. Add egg and vanilla and beat well. Add flour, salt, and baking soda, mix until well combined. Add pretzels and mix on low until just combined. 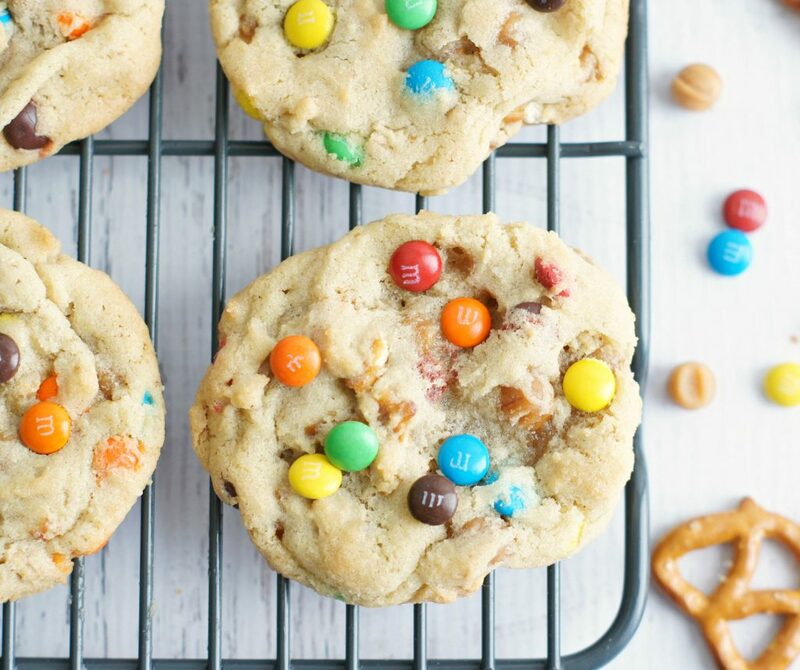 By hand, stir in M&M's and caramel bits. Using a cookies scoop, drop onto lined cookie sheet and bake 10-12 minutes or until edges just start to turn golden brown. These look soooo good! I think I might try filling the cookies with caramel sauce though, I’m not sure where I can get caramel bits. Thanks for such a yummy recipe! Thanks for looking. The caramel bits are in the chocolate chip aisle in most stores. Hopefully you can find them. These turned out yummy and so fun looking! Thanks for another great recipe Jodi!